In the summer of 2018 we was very excited and felt honoured when we was contacted regarding materials from KA114. KA114 was restored in New Zealand and finished and flying again in 2012. Both wings during restoration had to be totally replaced and the original wings were left outside exposed to the elements for several years until till we was contacted about these in 2018. After some negotiations and arranging, all was agreed and then over a period of nearly a year we managed to import both wing timbers, consisting of Douglas Fir and Spruce and hundreds of original Brass screws. In 2013 the much awaited de Havilland DH-98 Mosquito, serial number KA114 joined the military aviation museum. These aircraft were unique because they were constructed almost entirely of wood, giving them the nickname of the "Wooden Wonder". Mosquitos were produced by the de Havilland company in 1940 and when it entered mass production in June 1941, was one of the fastest, if not the fastest operational aircraft in the world. In April 1948, after the end of World War Two, the Mosquito was purchased by a farmer for $150.00. 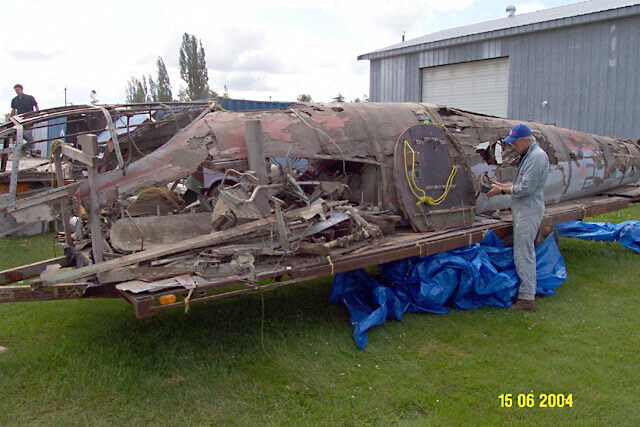 Stored on his property in Milo, Alberta, parts of the plane were used to repair farm machinery, the engines and props were taken by the air Force, and at some point, the wheels were removed. The aircraft even served briefly as a hen house. In 1972, a much younger farmer became interested in the aircraft. Eighteen-year-old Clint Armstrong knew it was an old aircraft, Clint drove out to the farm to take a look. Excited to learn the old plane was a Mosquito, the teenage owner and his father began the task hauling it on a flat deck 30 miles cross country to their property. Clint and his father knew there wasn't much they could do with the relic from the Second World War, but they didn't want to see the plane deteriorate any further. The plane sat behind the machine shed on Armstrong's farm for about 4 years before Clint sold it to Ed Zeleski from the Richmond B.C. Air Museum for its original purchase price of $150.00. The aircraft was to be restored as a static display. Unfortunately, the weather took its toll, and the wooden airframe had deteriorated more over the years. In 1978, it was purchased by the Canadian Museum of Flight and Transport (CMFT). 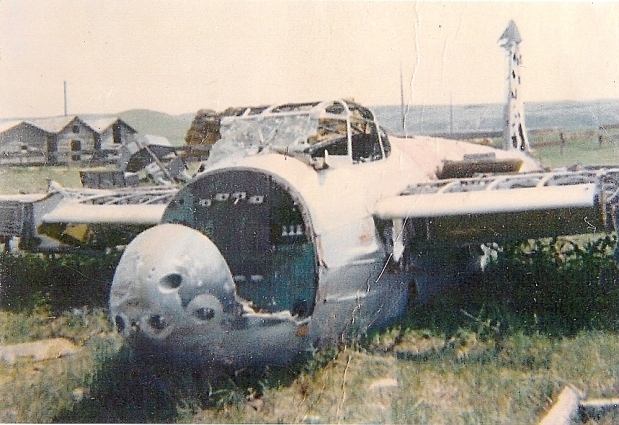 As CMFT took possession of the aircraft, the forward section of the fuselage disintegrated, and the fuselage broke in half behind the wing area. It was also missing both engines and parts of the landing gear. It spent several years in storage at CMFT before being finally sold for $30,000 to the Military Aviation Museum in 2004. Once purchased by the museum, it was sent to AvSpecs in New Zealand for restoration. Although the wood was in terrible condition, many of the metal parts could still be used. Glyn Powell, of Auckland, New Zealand, was enlisted to create a new fuselage, wings, and tail sections. Powell employed a top boat builder to assist with creating the molds and applied a modern epoxy instead of animal glue to join many of the pieces. Otherwise, Powell say that he was "absolutely faithful to the original drawings and specifications". It took almost three years to build the wooden airframe. Two former Royal New Zealand Air Force Merlin 25 engines were located in Australia, complete with original Mosquito mounts and accessories. These were sent to California to be restored and overhauled by Vintage V-12s. The Mosquito is painted with the markings of 487 Squadron RNZAF as EG-Y in honour of the Royal New Zealand unit flying Mosquitos during WWII. They flew a number of high profile raids including the attack on Amiens Prison in February 1944. The attack destroyed a wall enabling hundreds of French prisoners of war to escape. The New Zealand Civil Aviation Authority (CAA) issued the Mosquito a Certificate of Airworthiness in September 2012. It took its first flight in over 60 years on September 29, 2012 at Ardmore Airport near Auckland, New Zealand. This was the first public flight of de Havilland Mosquito in over 16 years. The museum's Mosquito finally arrived in Virginia Beach in March 2013, where the Fighter Factory crew, assisted by members of the AvSpecs team, reassembled it. Altogether, the Mosquito spent eight years and thousands of hours undergoing restoration.